Preparation: Bring water, vinegar, sugar and salt to boil over high heat, then remove and cool completely. 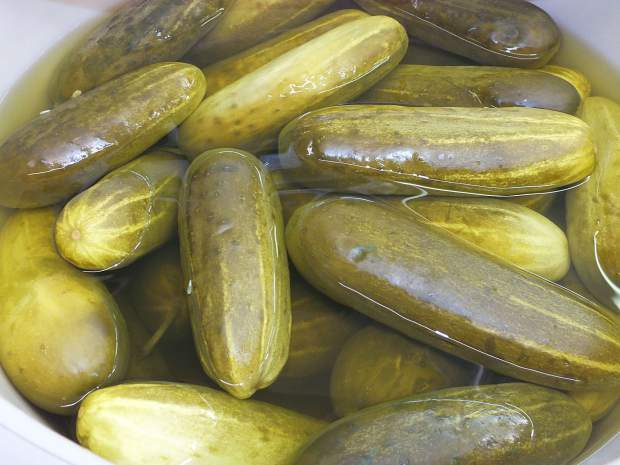 Combine cucumbers, garlic and dill in large glass or plastic container, one with a lid. Pour cooled vinegar mixture over cucumber mixture. Seal container with lid and refrigerate for at least three days. According to the Sports & Fitness Industry Association’s 2016 Pickleball Report, there are currently 2.5 million players nationwide, and it seems all of them converge at the Truckee-Donner Recreation & Park District gym on Tuesdays, Thursdays and Fridays. For such a silly sounding sport, these “picklers” (as the players are known at TDRPD) really take the game seriously. They make their presence known. They are darn right worked up and aggressive. They are, like, real athletes. You can hear them while you’re running the indoor track; “The music is too loud to hear the score,” “We need more courts,” and “Put the rims up.” Raise the basketball hoops? How high are they going to hit that ball? Bottom line: The picklers are here to play ball, and have a lot of fun while doing so. This year pickleball celebrates its 52nd anniversary, which is crazy considering how many people still don’t know what it is. It is a racket sport, played on a court that looks like a mini-tennis court. The ball is perforated plastic, similar to a whiffle ball, and the paddles are composite or wood and about twice the size of pingpong paddles. In Tokyo, where real estate is dear and open space scarce, it is hugely popular and played on rooftops. Stateside it is played indoors and outdoors, and, apparently at the TDRPD gym. It’s a fast-paced game and easy to learn, but can get very competitive for experienced players. Part of pickleball’s universal appeal is its friendly, social nature, and multigenerational attraction. In fact, a couple of us TDRPD employees went to pickle regulars Sandy and Kevin Nieland’s Christmas party last year, and it was the fête of the season. There was tons of food, drink and people of all ages — all picklers — dressed up and out of their sportswear. Recently Park and Rec had to add another pickleball timeslot to our schedule. Seems Tuesdays and Thursdays from 10:30 a.m. to 2:30 p.m. was not enough. We now have picklers on Fridays from 5-8 p.m.
That’s a lot of pickleball, but no way will it be enough. These folks are nothing if not enthusiastic about their sport. So enthusiastic when approached for a healthy recipe for this column they shared one for — you guessed it — pickles. This column comes courtesy of Truckee Donner Recreation & Park District staff and members, inspiring creative, active lives for a healthy mountain community. For more information on how you can stay in shape this season and take advantage of the Summer Pass, visit tdrpd.org or check out our Facebook page at http://www.facebook.com/TDRPD.